D-Link quick setup wizard is enough for an average user to set up his router but for advanced options, it is better to learn how to configure this device manually. This tutorial explains how to configure every model of D-Link wireless router manually for advanced features. Here we learn how to enable Internet access, WiFi and WiFi security. The first step of this guide is to make sure you can go online with the modem by connecting a computer to the Ethernet port of the modem. 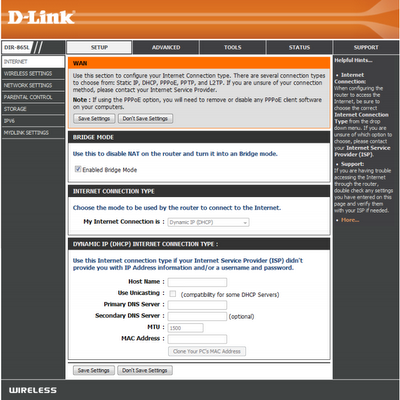 If it is fine, disconnect the modem and connect the computer to one of the LAN ports of D-Link Wireless Router using an Ethernet cable. Now power on the device. Type 192.168.0.1 on Browser address bar and press enter. Enter username admin and leave the password field blank. Click on login to access setup page. Using the drop-down menu, you can select the Internet connection type you are using. Configuration details for each of the Internet connection types are listed below. 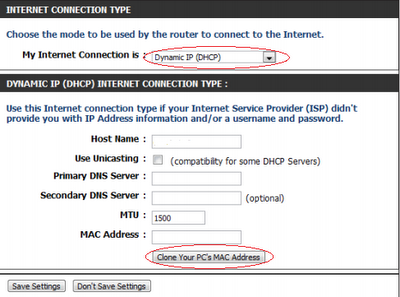 To setup, your router with cable Internet, select the option Dynamic IP(DHCP). If you are using cable Internet connection the most important step is to click on the button Clone Your PC's MAC Address. To know the importance of this step, click on the link below. If your cable ISP doesn't provide any details about Host Name, DNS Server, etc.. leave them blank or keep the default value. Do not forget to click on Save Settings button. 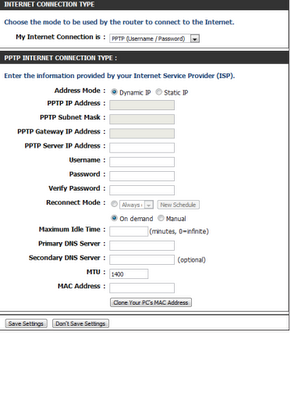 With DSL broadband, you should select the option PPPoE(Username/Password) from the drop-down menu. Enter the Username and password provided by ISP. 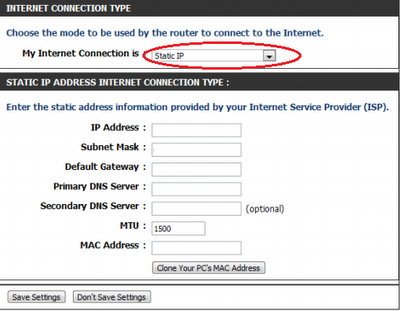 Keep the Address mode "Dynamic" if your ISP does not provide you any IP address details. Normally for a DSL connection, you do not need to clone computer MAC address unless asked by your ISP. Click on Save Settings after entering details. 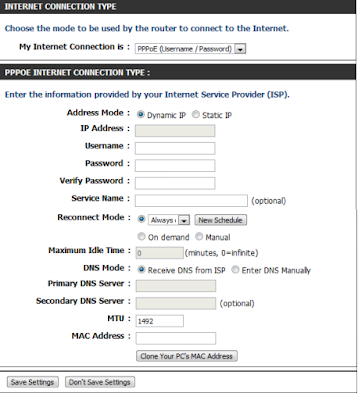 Steps to setup your router with PPTP connection is similar to PPPoE connection. Here you should enter the full IP address details provided by your ISP including Subnet Mask, Default Gateway, DNS Servers, etc. After entering details click on Save Settings. I recommend you to perform a power cycle if you face any issues with going online. To do the power cycle follow the steps mentioned in the link below. Right after configuring Internet access on the D-Link router, you need to configure the wireless settings if you want to use it. Latest D-Link wireless routers support both 2.4GHz and 5GHz frequencies. So it can extend its support for 802.11a, 802.11b, 802.11n, and 802.11g wireless standards. 802.11n supports both 2.4GHz and 5GHz where 802.11a supports 5GHz only. 802.11b and 802.11g work in 2.4GHz. 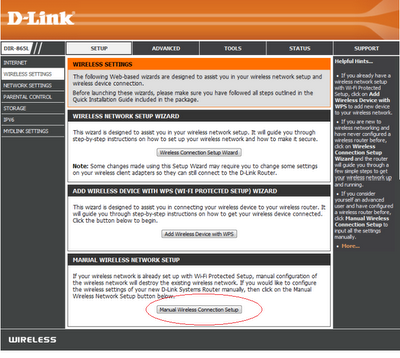 Here we share the manual steps to configure wireless and security on the D-Link router. 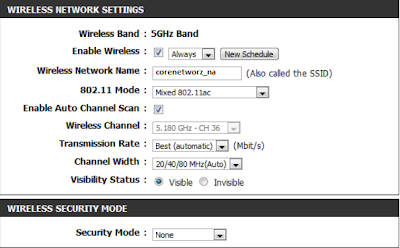 Click on Enable Wireless and Select 802.11 mode (2.4GHz). Now D-Link Wireless Router will automatically pick the channel with least interference. Here you can write the name of your wireless network (SSID). SSID can be up to 32 characters, and it is case sensitive. 20/40 MHz if you are using both 802.11n and non802.11n devices. 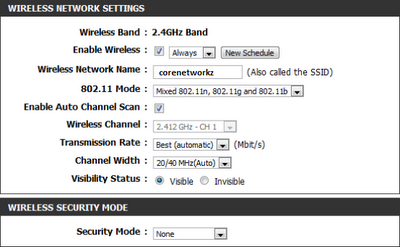 If you are not using 802.11n devices, you can select 20MHz. If you do not want to show your SSID, you can check the option Invisible. 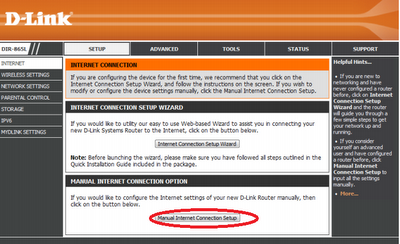 In this article, you have learned to set up a brand new D-link router without the help of a setup disc. Configuration with a DSL connection is different from a cable broadband connection. Do not forget to secure the device with a new login username and password. You should also set up a strong WiFi passphrase to prevent unauthorized use by intruders. It is simple, I thought only with wizard I can configure this router. Is there any compatibility issues between Linksys wireless router and D-Link wireless router ? I read in forum one user face some difficulties with connecting a D-Link router and Linksys wireless router. When asked customer care they said both are not compatible. Any thoughts ? Normally there is no compatibility issues between Linksys wireless router and D-Link wireless router. To check more about your case please provide the model numbers of both routers you have. I have an older version of D-Link Wireless router. When I contacted D link support, they said mine is too old to get support. Can you help me to fix my router? I am planing to buy D-Link Gaming Router (DGL-5500), when available here. I would like to know the speed, wireless specifications, wireless and router security in D-Link DGL-5500 router and also want to know is it worth money? If your router in bridge mode, you cannot connect any wireless devices to it. So, either you need to connect a PC to your router with an Ethernet cable to access the wireless setup page, or you need to reset and reconfigure it. If you are attempting to configure a D-Link router, take note of your computer's Default Gateway IP address.